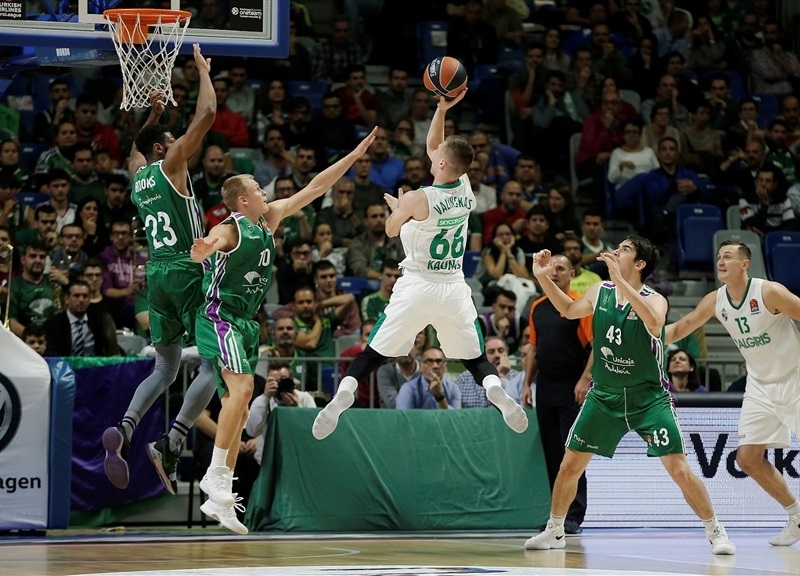 Zalgiris Kaunas wasted a 20-point lead, but managed to beat Unicaja Malaga on the road 83-85 after overtime with Edgaras Ulanovas hitting the game-winner at the buzzer. 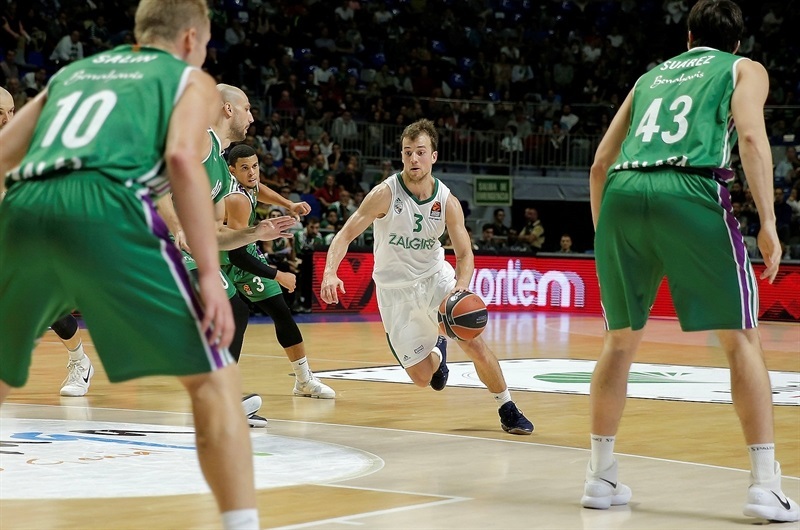 Kevin Pangos nailed 5 three-pointers in scoring a game-high 21 points to go with 5 assists for Zalgiris, which improved to 4-3 with its third road win of the young season. Arturas Milaknis added 13 points, while Ulanovas and Aaron White both chipped in 10 points. 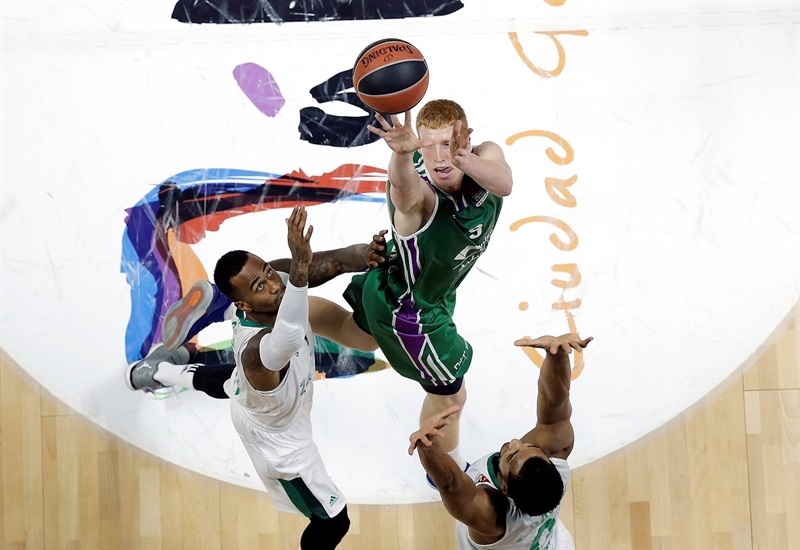 Unicaja saw its two-game winning streak snapped and dropped to 3-4. Ray McCallum paced Unicaja with a career high 19 points - including the layup to force overtime. Jeff Brooks evened his career best with 16 points and set new personal marks with 11 rebounds and an index rating of 29. 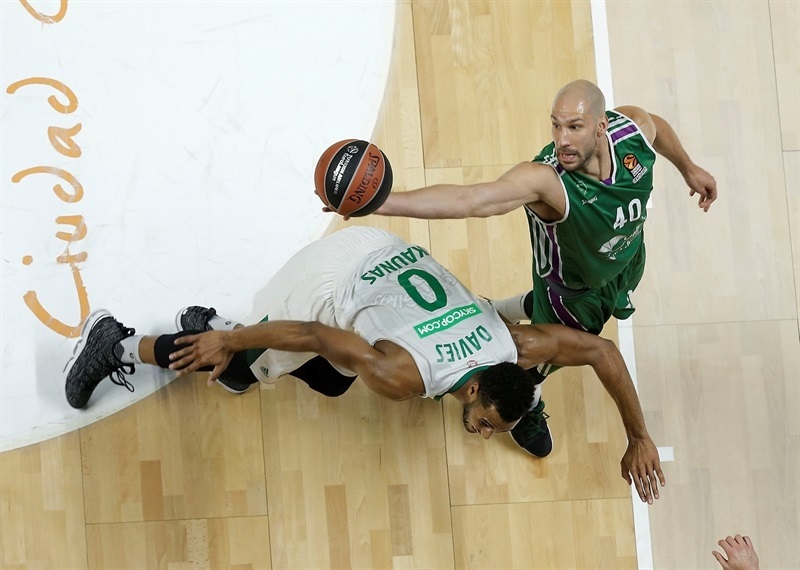 Unicaja was playing without leading scorer Nemanja Nedovic, who was out with a shoulder injury. 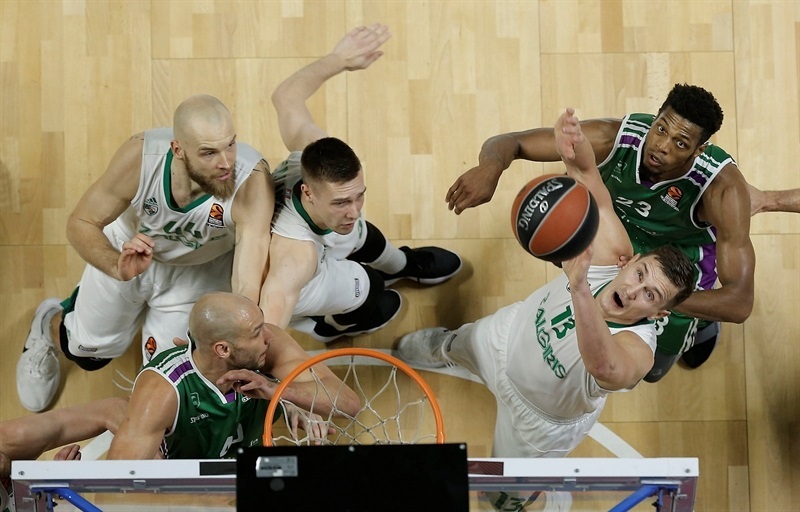 Unicaja made just 4-of-18 three-pointers (22.2%) which helped Zalgiris overcome committing 22 turnovers. McCallum started things with a jumper from the left wing with Paulius Jankunas answering with a spin move and layup. 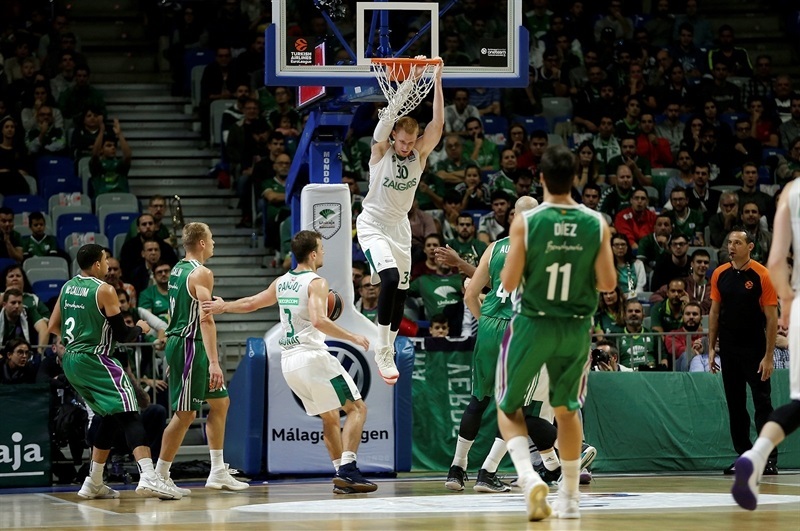 Unicaja pulled away for the first time with a Giorgi Shermandini score off the glass and a Daniel Diez three-ball to make it 9-4. Brooks had some great energy in the first quarter, putting back in his own miss and picking up two free throws for a 13-9 lead. Zalgiris put the clamps on the defense and started to take control of the proceedings. 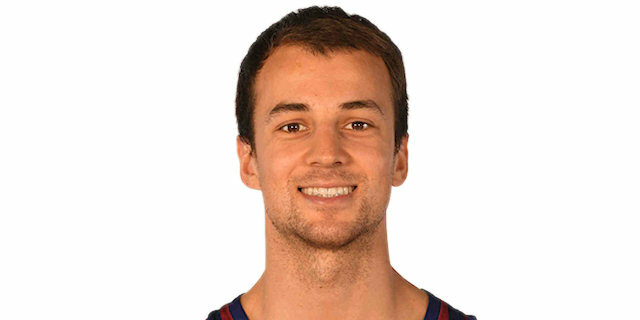 Pangos knocked down Zalgiris’s second three-pointer and then set up an alley-oop dunk for White to put the guests ahead 13-14. Axel Toupane added four points and White drained a three-ball as well to complete a 2-12 surge for a 15-21 advantage for Zalgiris. Free throws from James Augustine ended Unicaja’s five-minute drought and the score was 17-21 after 10 minutes. Dejan Musli fed Dragan Milosavljevic for a dunk early in the second quarter. Musli added 4 free throws and Adam Waczynski converted a fastbreak layup in a 10-2 Unicaja surge for a 27-23 lead. But Zagiris put together a run of its own, starting with a three-pointer and layup from Pangos and finished by steals and transition finishes from White and Vasilije Micic to complete a 2-11 run for a 29-34 advantage. McCallum tried to keep Unicaja in the game with two baskets, but Pangos was on target again from long range and an Ulanovas tip-in helped Zalgiris to a 34-41 lead at the break. Zalgiris continued its blistering shooting to start the second half with Pangos and Milaknis both knocking down threes and Milaknis converting a three-point play to make it 34-50. 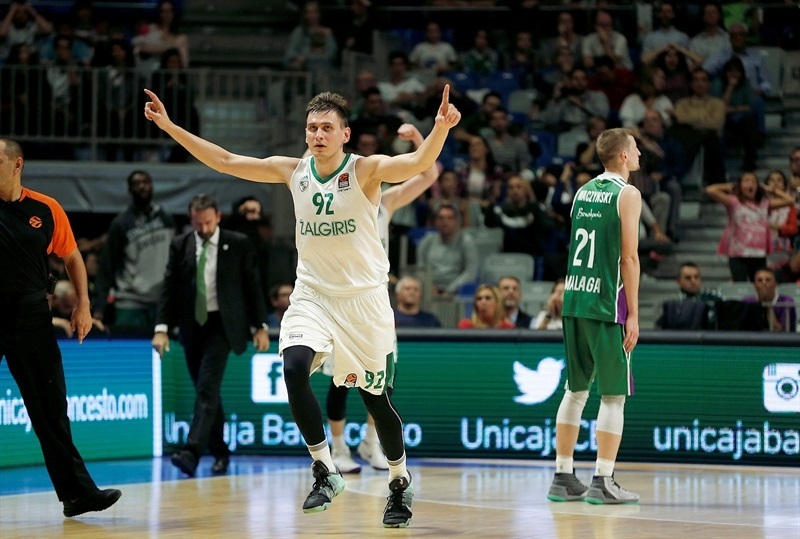 Milosavljevic finally scored for Unicaja after three minutes, but Pangos hit from long range again as did Paulius Valinskas as the cushion increased to 20 points - 36-56. 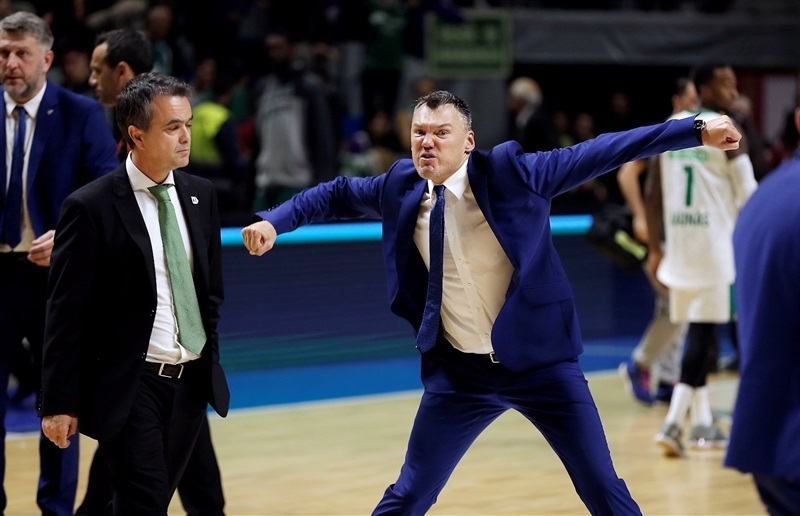 Brooks tried to keep Unicaja alive with a basket and three-pointer. A couple of turnovers by Zalgiris allowed Unicaja to inch closer with more Brooks free throws and a basket from Augustine to trim the gap to 10 points. Dee Bost snapped the 0-10 run and Zalgiris was up 48-59 after three quarters. Salin opened the fourth quarter by getting the deficit to single digits. Antanas Kavaliauskas put back an offensive rebound, but he and Jankunas both fouled out around the seven-minute mark. Free throws from Milosavljevic trimmed the margin to 53-61. White snapped the Unicaja surge with a three-point play, but Waczynski answered with a three and McCallum’s layup cut it to 58-64. The margin was back up to 11 points at the 2:43-minute mark after two scores from Ulanovas. 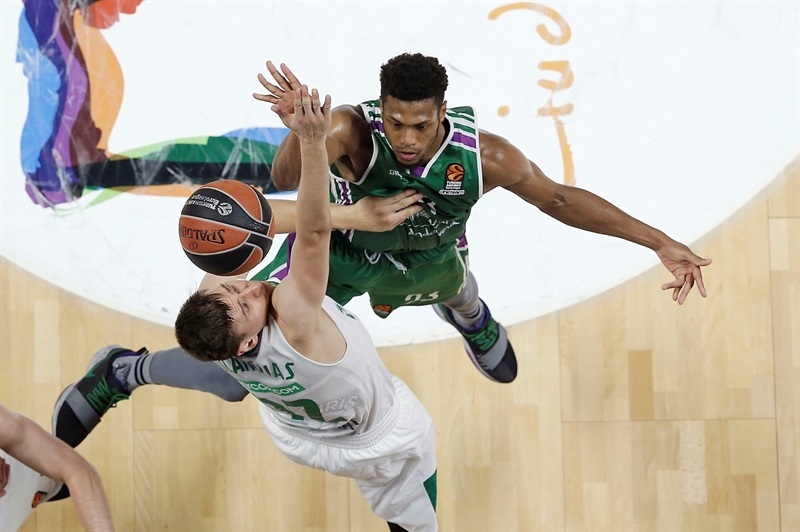 McCallum and Brooks would not let Unicaja go down without a fight: McCallum scored 5 straight points and Brooks came up with a big steal and assist and 2 free throws. 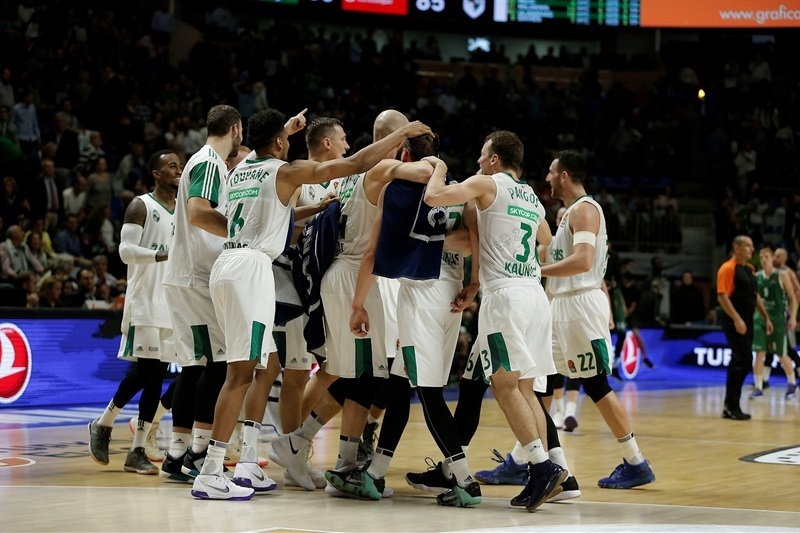 But Unicaja needed a McCallum layup with 3.1 seconds left to knot the game at 72-72 and force overtime. Pangos scored first in the overtime and Ulanovas made it 74-78, but Carlos Suarez converted a three-point play for his second basket of the extra session. 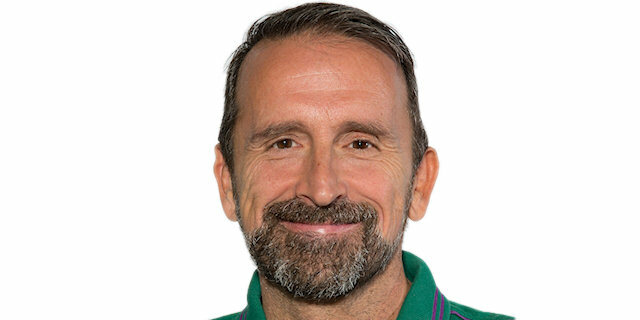 The Unicaja forward put in a miss just before the shot clock to knot the game at 81-81. A Brandon Davies score had Zalgiris up by 2 with a minute to play. McCallum again looked to play hero with a spin move on the drive and then a layup to tie the game at 83-83 with 1.9 seconds to play. But that left enough time on an in-bounds play for Micic to find Ulanovas, who rose up and knocked down a lefty jumper for the winner at the buzzer. "With all of my teams I can never guarantee that we are going to win. If anyone says they are going to win all their games, it’s a mistake. Of course we can always say we’re going to fight and try not to have games that we need to come back from 20 points. But just because we are playing at home doesn’t mean we will always win. The message I want to give to the season ticket holders is maybe there might be a few games where there is a sense that it wasn’t worth it to come here, but we always play our hearts out 99 percent of the games. We do the best that we can. No one wants to have a game where you are 20 points down with a low percentage like we had. But I am proud that we didn’t throw in the towel. We nearly saw a second overtime and for better or worse I leave with a sense of pride in my team. And this is our philosophy as a team. Of course there are some reasons we lost this game. We had 16 turnovers. We had 11 in the first half and just 5 in the second half. And we had 22 percent from three-point shots and they had 47 percent. They shot 20 percent better in two-point shots. The difference in this game wasn’t bigger because of the commitment of our players. Our players don’t cry due to adverse circumstances, they work hard. I haven’t seen the video yet, but when you come back from 20 points down in a game it means that you have worked very hard. In the end, we are proud of the work we did - even the last shot they made it was a contested shot and we played good defense. Our team competed until the very last minute. " "The only thing we can say is we got the win. It wasn’t pretty. A lot of things weren’t going our way in the second half. But we got the win. I think we were playing some excellent basketball until a lot of things changed on the court. We have to be happy any time you win in the EuroLeague… We are very happy for our team to come out of here with a win and also to show this character in the fourth quarter and overtime when things were really not going for us. We have to be very happy because it’s a great win. " "It was a very difficult game, very complicated, in which we allowed some big runs that made it hard for us to come back. We managed to do it and take the game to overtime, but the game slipped away in the final second. We have to carry on working hard in order to bounce back on Thursday." 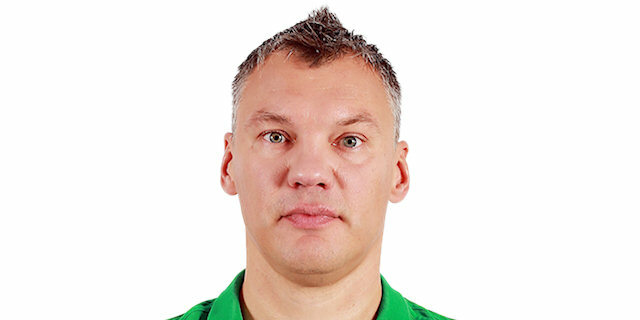 "Very important win. It wasn’t pretty at all. They’re a really good team, a tough team. We just grinded it out, a credit to our guys. It wasn’t pretty at all. "